Unlike its Wii U counterpart, Sonic Boom: Shattered Crystal on 3DS is an experience that is much more reminiscent of a traditional Sonic game. It takes place with a 2D perspective and your goal is to get to the finish in typical Sonic style — unlike traditional Sonic games however, it's not quite as simple as that. Sonic Boom: Shattered Crystal is separated into three different level types. The bulk of the levels are exploratory in nature and require you to scour the world as Sonic, Tails, Knuckles, and newcomer Sticks in search of Crystal Shards, Blueprints, and ultimately the goal. You'll have to switch between different sections using an Enerbeam Slingshot, most of which act as a checkpoint, and all of these sections take on a Metroidvania-style layout with patented Sonic speed added into the mix. Don't worry, though, this speed is much more regulated than more recent 2D Sonic capers, and is closer to Sonic's original, fairer pacing. Considering the fact that the evident priority of these levels is to explore, this pacing is an absolute must; it's good to see that the developer has taken more consideration into the style of the level than to just tear around at blistering speeds and impede the gameplay. 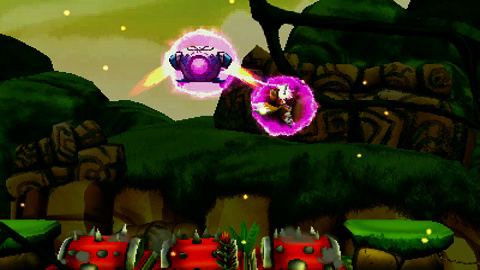 Each character's unique moves allow them to enter areas inaccessible by others in the team; this is never an obstacle, either, as you can switch between characters on the fly. 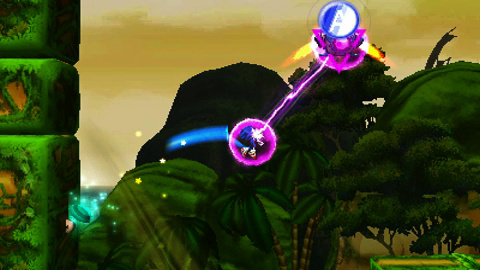 Each character also moves at the same speed, but their other movements remain true to their personalities. 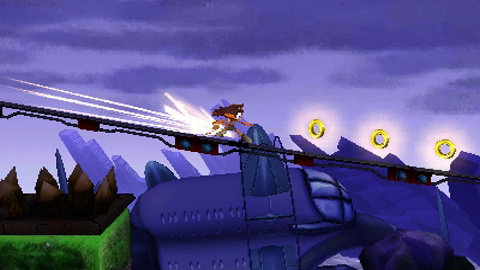 Sonic is the most agile, able to dash short distances in the air; Tails is able to use air vents to fly as well as descend much more slowly whenever he wishes; Knuckles has more attacks and power than his friends; Sticks can use her boomerang to attack enemies from afar. Combine these abilities with the focus on exploration, in particular, and it prompts you to keep your eye out for landmarks and opportunities to switch protagonist. The other two level types are much closer to more modern 2D Sonic outings, with an increased focus on speed rather than exploration. One has you speeding through the levels against an opponent with the same desire to reach the goal as you; the stages are more suited to this, and reward smooth gameplay but allow you enough time to react before an obstacle slaps you in the face. The other places you on a tubular track with the camera behind Sonic, similar to Sonic the Hedgehog 2's bonus stages; you're stuck on rails and have to shift between available tracks avoiding hazards and collecting rings. It's simple in its premise and actually works really nicely. This game is certainly more difficult than you might guess; finding all the secrets in the exploratory levels is no easy feat, as once you use an Enerbeam Slingshot to move to another section you're usually unable to return to that area without restarting the level entirely. These one-way systems force you to really look at every detail and crevice, and you won't usually find everything in a single run. You also won't start the game with all four of the characters, which are required to find everything in a level due to their unique abilities; a playthrough of each level that is orientated around speed is also required in order to acquire all of the unlockables. The levels where you race against an opponent are probably the easiest of the three, but they're still a lot of fun; the tubular levels are simple to finish, but difficult to complete entirely. In order to complete these latter levels fully you'll have to collect every single ring and boost as much as you can, which really ramps up the difficulty. This title isn't all sunshine and roses though, and suffers from a number of niggling issues. You'll have unlocked all the characters within about an hour and a half of gameplay, meaning replaying previous levels to find all the secrets happens too quickly for the experience to be particularly engaging, and would perhaps have been better if you unlocked them in more of a staggered manner. Even so, that still wouldn't take too long, as the main game is decidedly short. If you decide to unlock all of the secrets you'll get a few more hours out of it, but it feels rather like artificial padding, and it's required if you want to unlock the final stage — not a great idea for any younger gamers that would find this frustrating. The visuals are also nothing to write home about. The characters look reasonable and the environments are pretty enough, but we feel that we and the gaming public have been spoilt by Super Smash Bros. for Nintendo 3DS, and the graphics aren't offensive enough to detract from the enjoyment of the game. You'll also not be troubled by the irritating voices from the Wii U version; instead grunts and whoops are the order of the day, which don't grate at all, especially compared to the 'quips' in Rise of Lyric. Surprisingly high score, the demo felt like trash to me. The demo was awful, it was really slow and didn't feel like Sonic at all. Exactly the score I expected. I really hate artificial padding, especially when they force it on gamers. I'm happy to explore, I always played Sonic much more like a platformer, but what about gamers who like to play Sonic for speed runs? For what it's worth, I still think it's better than Sonic Lost World for 3DS, but that isn't saying much. My blue friend, what happened? @Jordie well on the bright side, atleast no bad Sonic games on Nintendo systems for now seeing that we got one that's awful. Lost World atleast tried to emulate the Sonic feel while trying something different....if only the level design wasn't terrible. I'm not gonna bother getting this because the demo left me frustrated and the game really should 've used a d-pad instead. The demo was pretty fun IMO, not perfect, but very fun, I was even afraid the 4 character gameplay could become a problem in later levels, but sound like they managed that fine. Wait, so you move with the Slide Pad only? DPad is a huge deal to me when playing 2D games. That's why I personally rate Smash U an 8, maybe 7, because of the lack of DPad support on the Pro controllers. It's just not that enjoyable to me when my movements aren't precise and responsive as moving with the DPad. Yet another just average Sonic game so no surprise there really. Maybe some day I will pick it up should the game ever go down to a ridiculously low price! @Dpishere Like Pacman II.... I'll wait until I can get it for about 25 percent off. Both Sonic and Pacman have a special place in my heart.... and while I don't want to pay full price for it, I'll wait a little while and pic it up soon. Sega of America should have use that Sonic Boom money to bring us something else. I totally loved the demo and bought the game after playing it! I wasn't impressed by the demo either (even though I worked out it included a race level and a tubular level hidden on the World Map), but my biggest issue were the controls which just weren't quite intuitive enough. They just jumbled every move onto the face buttons, which could lead to the wrong button being pressed, instead of moving some inputs to the Very Distinctive shoulder buttons(which are just used to pan the camera…). The final score was what I was expecting from the state of the Demo, through reading the review makes you expect a higher score. "It's one of the better Sonic outings of recent times, but unfortunately that's not saying an awful lot." ?? several recent Sonic games have been fantastic. Why must people keep writing things like this? also, as many have said, the demo was utter rubbish. The level design in particular was embarrassing. Both games were plain bad this time around. Here's to hoping Sega finds the right path with Sonic again. The demo was pretty good and I enjoyed the exploration aspect, but the fact that it is mandatory kind of detracts from my desire to buy this game. I enjoy exploring but sometimes I just want to go fast. Yeah- going fast in a Sonic game. I'm still awaiting the next Sonic Team game. Yep, there's a reason why the only situation in which Sonic would say "I am God" would be in fan-made crap. Poor Sonic so much hate the game is not that bad the demo is not that bad either I don't know why they even make Sonic games anymore most people just want to bash them . I like thw demo, may get it when it's cheap. @Tsuzura I'm so upset they blocked American IPs... I played the HECK out of the Japanese version!! It wasn't awful, but I think I'll wait for it to go down in price significantly. @Tsuzura They should have used the money to get Sega to make a new Sonic colors game.Now that will be worth the money and time. @rockodoodle @Dpishere I'm with you two on this one. I'm gonna wait for a lower price before considering getting this game. I need to try the demo still though. You put on the wrong Trailer, it shows the Wii U game, not the 3DS one. l wasnt that impressed with the demo the first time I played it, but after playing through it a couple of times more it really grew on me. I've played the demo through a few more times now and have found it really fun so I'll definetely be picking up the game. I would'nt write this game off too quickly. I'd recommend playing through the demo at least a couple of times as it takes a bit of time to get a feel for. Once you do though its great fun. Might check out the demo. As over-hyped as the console version was, this one doesn't even appear to have it's own trailer. 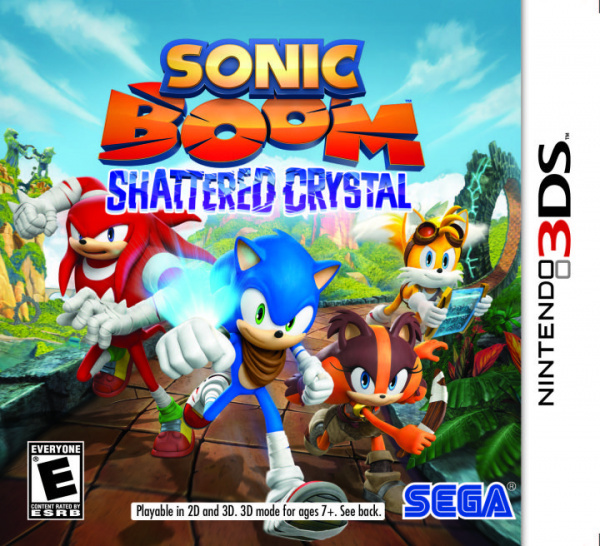 "Sonic Boom: Shattered Crystal on 3DS is an experience that is much more reminiscent of a traditional Sonic game," but that doesn't stop it from sucking. It's because some of us prefer the DPad and are more responsive or reactive to it. I personally find the left stick inaccurate on those oh poopoodoodoocacapoopledoople situation. I dash when I don't intend to. Sometimes I'm not attacking in the direction I want to. And what's so wrong with a DPad inclusion for those who prefer it? We are missing some directional input that the Lstick provides? Why not have both and include the DPad along with the left stick for movement like in SM3DW and other games? I don't think I'll be missing a button at all. The taunts? I'll put the UpTaunt on L, DownTaunt on ZL, SideTaunt on R, shield on ZR, grab on Y, special on X, Smash on RStick, attack on A, jump on B (because I preferred that setup). I don't mind dashing with double tapping. I'm use to it. I assure you I can do 3x better on the DPad than on the LStick right now. Plus I only intended to play and enjoy the game at home with friends and online. I don't really need those LStick input on most of my preferred characters. I enjoyed the demo, doesn't mean I'm going to buy it fight away though. I'll wait for a discount. At this point I can't help the feeling that a level of prejudice is involved with Sonic games. No matter how they are, there's been so many mediocre attempts people cannot look passed it, approaching this game differently. Switch out the characters and IP and launch it not using the Sonic brand and people would praise this game for it's gameplay. Sega was doing great with the Sonic Advance and Sonic Rush series for GBA & DS, not sure why they decided to go this route of laziness for the 3DS. C'mon three Sonic games on 3DS and all are mediocre at best, perhaps it's time to call Dimps back to work. Only played the demo for a few minutes, may give it another go but it just seemed kinda bland.. So many better games to play on 3ds imo. hate to break it to you, but Dimps made two of those mediocre games. I wouldn't trust them after their lazy as all hell Sonic Generations 3ds verison, and the Sonic the Hedgehog 4 games. The demo was fun though. The thing about Sonic games is that the reviewer's scores are usually mediocre to bad. Nintendo fans often have the same opinion. But when you actually play it, you found it more worthwhile than what reviewers think (e.g., Sonic Lost World). The thing about Mario games is that the reviewer's scores are usually overwhelmingly good. Nintendo fans often have the same opinion. But when you actually play it, you found it worse than what reviewers think (e.g., Mario U and Luigi U). Sure i know Sonic has always been about Speed, Mario not so much, but if we can't get past that, then we can't see the game for what it might be. 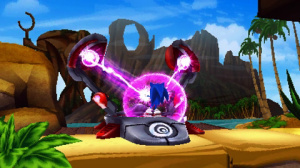 Do I think Sega should always use the Sonic franchise to try new things, no, Sonic boom could have been a better game(if only marginally) if Sega tried a new franchise, that being said I tried the demo to shattered Crystal, and thought it was decent, if not disorienting, I try to look past who sonic is to see if a game is fun enough to play, then I will drop the cash to get it. @RoomB31 You are right. Some Nintendo fans are stuck in old days, and that is why they do not open to new ideas and are satisfied with rehashed games such as Mario U. Don't get me wrong, there is still and will always be a market for the classics revisited, but ever thinking that we can stay in the land of nostalgia is a dangerous thing. @DiscoDriver43 Yes, Dimps does make two of those 3 mediocre Sonic games but when you compare those three to the ones from DS & GBA you notice a difference, the ones on DS & GBA were original titles (well except Sonic Colors which is bound to be good anyways), the ones released for 3DS were merely just ports: Sonic: Lost World, Sonic Generations, and Sonic Boom. The fact that they are ports allow players to compare them to their console version which when compare suffer from featuring the same enjoyment as those bigger versions. The GBA & DS ones were much better because they were Dimps own games (their own version of Sonic) created specifically for those systems thus making them solid titles which can't be compare as they had no ports to compare too. @Ryu_Niiyama Interesting you say that since that is the opposite problem over at Crapcom central. "Surprisingly high score, the demo felt like trash to me"
I agree: A very weak demo. I can speak only for myself when I say that I enjoyed the game on the 3DS. It was actually a good game, nothing to complain.